The Official CS Lancer Thread! Mitsu Lancer, Evo, GSR, MIVEC, 4G**, GDI, Galant, Outlander, L200 Sportero/Triton etc. idlemind wrote: Running a grounding kit is something I always wanted to do. Post some pics Biggs hopefully showing where each pt was terminated. Last edited by fras on April 21st, 2012, 7:04 pm, edited 1 time in total. I like the oil catch can. That can actually eliminate the throttle body problems that we GDI men have, as oil and blow by mist will no longer be routed back to the TB to clog it. Gonna install one next 3 weeks or so. i feelin sorry for the car now....she old. btw allyuh think 25,000kms in 9mths bad??? Love her too bad though..
aye i like dat dash...cus it showing u on 6th gear...digitally. what series of lancers came with that? Its the IP of a CS5 Touring. Have a 220km IP here but I prefer this IP as it unique. that just look real sweet. Location: Bringing HID & LED to a location near you! 355-3165. 704-5442 (WhatsApp). BrotherHood wrote: Fellas, my car seat stuck in one position. The back rest moves but the entire seat does not slide foward nor backward. I got the car this way. It's ok to sit in but it's beginning to become a nuisance. How can I solve this???? Took off two bolts to the front of the seat on the floor and another two to the back. The two at the back are hidden. One underneath a cover on the side with the seatbealt and to get to the other I had to remove the console over the handbrake, two screws inside the pocket. Got the seat out and upon inspection I noticed a tensioner spring that compresses and holds when you pull up the lever to slide the seat foward and backward was out of place. Had to unwrap a coil with a pliers to reassemble it back to where it holds. After a clean out and grease up, the track was moving freely backwards and fowards. idlemind wrote: Its the IP of a CS5 Touring. Love the IP. Can it work with auto? Glad you figured it out man. DIY is always the way to go, saves you alot of $$. All CS IPs are interchangeable. The car was originally CVT/Tiptronic hence the digital gear LCD. Now it's manual the PRNDDs and gear LCD doesn't work. I tried blacking it out by removing the bulbs, but it still shows, I feel the entire IP is like an illuminated card since it gives a ghostface finish. When the car is off you don't see anything. 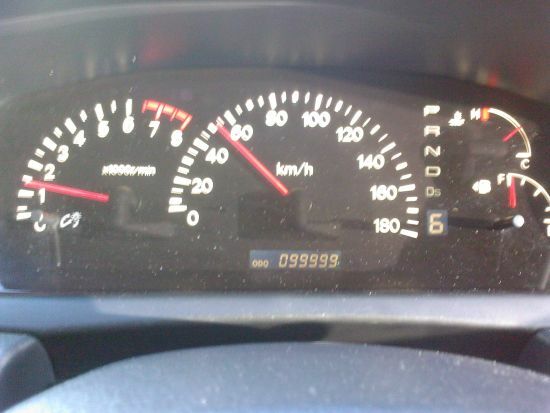 When it's on all the gauges come to life. Would it show the gear in automatic? best you go back to auto yes . . .
crankcase has a tiny leak...any suggestions? No venom. The option is there doing nothing. With that thinking is best they remove PRNDDs for the display all together then? Good Luck with that geo those CM5A tappet covers love to crack. It have a 2nr run through about 3. Think he got them with the car. Da IP you have there, can it work on automatic? I have one of those IP i was planning to sell....how much do they sell for by the way? idlemind wrote: With that thinking is best they remove PRNDDs for the display all together then? It will work with automatic but it will not show what gear you in as you are under CVT. CVT is one gear. D and/or Ds will illuminate. Last edited by idlemind on April 22nd, 2012, 10:56 pm, edited 1 time in total. my car is about to undergo some surgery guys. For the past two weeks it has overheated. At first I thought it was the radiator cap and the coolant bottle will fill to the brim every couple days, but then it started getting worse to the point where it was everyday I would have to pour the coolant back into the radiator. I will post of pics of the Grounding I did when I get the car back which will be next Saturday most likely. Brotherhood, happy that you were successful with that DIY. It's always a good feeling when you do stuff on your own and experience success no matter how simple a task it may be. Hey Fras I passed through D&D Auotworld in St. Mary's and saw the lancers there body, the same ones you inquired about. Biggs3ne wrote: :cry: my car is about to undergo some surgery guys. For the past two weeks it has overheated. At first I thought it was the radiator cap and the coolant bottle will fill to the brim every couple days, but then it started getting worse to the point where it was everyday I would have to pour the coolant back into the radiator. Sorry to hear man. That's a car for you. Does weird things sometimes. Biggs3ne wrote: Hey Fras I passed through D&D Auotworld in St. Mary's and saw the lancers there body, the same ones you inquired about. idlemind wrote: It will work with automatic but it will not show what gear you in as you are under CVT. CVT is one gear. D and/or Ds will illuminate. Where is your trip meter though? Its above the odo in our CS on the same LCD screen. lol . u hadda press the black button 3 times. 1st press shows trip A, 2nd- trip B, 3rd ODO. I prefer to see the trip meter and odo the same time without pressing any button, more convenient. Reset at the gas station, jus a habit to make sure I get good mileage. X2 you'll be surprised at how you can measure performance and pick up on developing problems by just comparing at mileage on an empty tank. Looking for some tailights nuts/bolts and 12 mudguard screws. Who has or where can I go to get/purchase?